This is one of the girls’ favorite snack and they have become quite adept at making this snack themselves. We like to make our own tortilla chips by frying up leftover corn tortillas. They taste so much better than the store bought ones, we think. For best taste, we like to make everything from scratch from the tomato salsa, the guacamole to the melted cheese. MELTED CHEESE. If you’ve never melted cheese before, there are more than a couple of ways to do it. I will tell you about the two methods that the girls use. One is to simply melt it in the microwave; but if you’re not careful you can end up drying the cheese out instead. To be on the safe side, add a little liquid, like a little salsa if you like it spicy, or a tablespoon of milk, to the cheese you are melting. Microwave on high for a couple of minutes, stop and stir. Keep doing this until the cheese is melted. Another way is to melt it on top of the stove. Place the cheese and liquid in a small pot or saucepan and melt over low heat, stirring constantly until the cheese is melted.GUACAMOLE. The taste of fresh avocados is hard to replicate and preserve so try to use fresh when you can. The pre-made and packaged guacamoles just cannot compare to freshly made ones. I have previously posted a recipe here. When the girls are being really lazy, they just mash up avocadoes and season it with salt pepper, and a spritz of lemon. You can adjust the guacamole recipe to suite your taste. SALSA. All you have to do to make a refreshing salsa is mix together tomatoes, onions and cilantro. You can add hot peppers for spice. 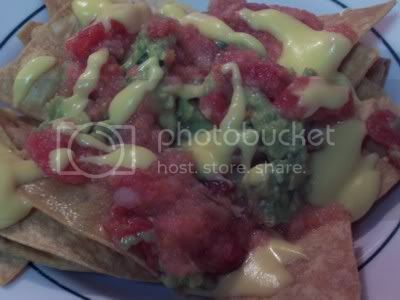 For this version of their nachos, the girls put the salsa ingredients through the blender and got a finer salsa. You can leave it chunky, or blend it as the girls did. Either way, it’s still delicious. It b my daughters!!! hi girls, I miss you guys too 🙂 LOL!! at your main food groups. I wish I was with you. Have fun though, and I’ll see you soon!! hey miss bambi, why don’t you post some of what you’re cooking over there? hi kaoko, yes, gotta use real cheese for best results. Although, I’m not totally going to snub velveeta 🙂 It will do when you’re in a pinch. For our nachos, we use a mixture of monterrey jack cheese and cheddar. Sometimes it helps if you grate the cheese first or cut them in little cubes. It makes them melt faster and not burn or get hard.